^ You’re tired of the infighting, you’re tired of the political games and the arcane procedural rows, tired of MPs talking about nothing else but Brexit when you have real concerns about our children’s schools, our National Health Service, knife crime. You want this stage of the Brexit process to be over and done with. I agree. I am on your side.It is now time for MPs to decide. ^ "Brexit, n." OED Online. Oxford University Press, March 2017. Web. 9 May 2017. ^ Tom Peck (28 December 2017). UK must pay for French ports after Brexit, Macron to tell May . The Independent. ^ Miller, Vaughne (2015-07-13). The 1974-75 UK Renegotiation of EEC Membership and Referendum. https://researchbriefings.parliament.uk/ResearchBriefing/Summary/CBP-7253. ^ Tarran, Brian (8 April 2016). "The Economy: a Brexit vote winner?" ^ The Europeans need us more than we need them. ^ Barack Obama's views betray a 'woeful ignorance' on the impact of the EU on Britain's security, says Armed Forces minister, telegraph.co.uk; accessed 23 April 2016. ^ "EU makes Britain even greater": Obama, telegraph.co.uk; accessed 23 April 2016. ^ Sampson, Thomas (2017). "Brexit: The Economics of International Disintegration". Journal of Economic Perspectives. ^ Consolidated version of the Treaty on European Union. https://en.wikisource.org/wiki/Consolidated_version_of_the_Treaty_on_European_Union/Title_VI:_Final_Provisions#Article_50. ^ "Angela Merkel says "nein" to Theresa May's calls for early deal on rights of EU migrants and British ex-pats". The Telegraph. Retrieved 18 January 2017. ^ Kuenssberg, Laura (17 January 2017). "Brexit: UK to leave single market, says Theresa May". BBC. Retrieved14 May 2017. ^ "European Council (Art. 50) guidelines for Brexit negotiations". Council of the European Union Website. Council of the European Union. 29 April 2017. ^ Foster, Peter (29 April 2017). "EU Brexit guidelines: What's in the document, and what it really means". The Daily Telegraph. ^ "Brexit: UK 'not obliged' to pay divorce bill say peers".BBC News. 4 March 2017. ^ "Council (Art 50) authorises the start of Brexit talks and adopts negotiating directives – Consilium". Europa (web portal). ^ "Brexit: UK caves in to EU demand to agree divorce bill before trade talks", The Guardian, 19 June 2017. ^ Abert, Eric (27 June 2017). "Brexit: les expatriés, premier bras de fer entre Londres et Bruxelles [Brexit: Expatriates, the first armwrestling match between London and Brussels]". Le Monde. Paris. ^ "Brexit-Verhandlungen: London will EU-Bürger in Grossbritannien halten" [Brexit negotiations: London wants to keep EU citizens in Britain]. Neue Zürcher Zeitung. 26 June 2017. ^ "Reality Check: Britain and EU at odds over citizens' rights". BBC News. 27 June 2017. ^ "EU and UK 'singing from same hymn sheet' on Northern Ireland". The Irish Times. 20 July 2017. ^ Nuspliger, Niklus (20 July 2017). "Zweite Verhandlungsrunde in Brüssel: London bleibt zu Brexit-Rechnung unverbindlich" [Second round of negotiations in Brussels: London remains non-committal to Brexit bill]. Neue Zürcher Zeitung. ^ "Brexit: UK and EU at odds over "exit bill"". BBC News. 21 July 2017. ^ "UK forwarders: Brexit customs proposal short on details". joc.com. 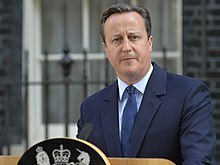 ^ "PM: UK leaving EU court's jurisdiction". BBC. 23 August 2017. ^ "Brexit: Jean-Claude Juncker criticises UK's position papers". BBC News. 30 August 2017. ^ "Huge gulf in negotiations on UK's Brexit bill". The Irish Times. 31 August 2017. ^ "Brexit: "Significant differences" over exit bill says Davis". BBC News. 5 September 2017. ^ "Don't use Irish border as test case for EU–UK border, says Barnier". The Irish Times. 7 September 2017. ^ "Keep EU trade as it is until 2021 – May". BBC. 22 September 2017. ^ CNN, Laura Smith-Spark. "UK PM seeks to break Brexit deadlock". CNN. ^ Guardian Wires (22 September 2017). "Theresa May's Brexit speech in Florence – watch live". YouTube. ^ "The Latest: EU's Brexit Chief Welcomes 'Constructive' Speech". USNews.com. ^ "Brexit: UK needs to clarify issues – Macron". BBC News. 23 September 2017. ^ "UK explores 'no deal' Brexit". BBC. 9 October 2017. ^ Foster, Peter (7 September 2017). "Brexit trade talks deadline to slip to December, says European Parliament chief". The Telegraph. ^ "Border deal is not likely until October, Taoiseach claims". The Irish Times. 11 June 2018. ^ "Commons set for Brexit vote showdown". BBC News. 20 June 2018. ^ "Brexit: Cabinet backs draft agreement". BBC News. 14 November 2018. ^ "Brexit: Dominic Raab and Esther McVey among ministers to quit over EU agreement". BBC News. 15 November 2018. ^ "EU repeal bill wins first Commons vote". BBC News. 12 September 2017. ^ "Conclusions adopted by the European Council (Art. 50), 29 June 2018" (PDF). europa.eu. ^ Anushka Asthana (20 December 2016). "Theresa May indicates MPs will not be given vote on final Brexit deal". The Guardian. ^ Asthana, Anushka; Walker, Peter (19 April 2017). "Theresa May calls for general election to secure Brexit mandate". The Guardian. ^ "'This is your chance,' Lib Dems tell voters opposed to Hard Brexit". The Herald. 18 April 2017. ^ "Lib Dem leader Tim Farron responds to Theresa May's general election announcement". The Independent. 18 April 2017. ^ "Stronger for Scotland" (PDF). SNP website. 1 June 2017. ^ "SNP manifesto summary: Key points at-a-glance". BBC News. 30 May 2017. ^ "Conservatives agree pact with DUP to support May government". BBC News. 26 June 2017. ^ Elliott, Larry (4 August 2016). "This is the Bank of England's all-action response to Brexit". The Guardian. ^ "Trotz Brexit: Bei Investoren bleibt Großbritannien die Nummer eins in Europa [Despite Brexit: For investors Britain remains Number One in Europe]". FAZ. 11 June 2018. ^ Wright, Robert (22 February 2018). "Annual net migration of EU citizens to UK falls below 100,000".Financial Times. ^ Jim Pickard (30 October 2017). "Key details of Brexit impact reports on 58 industries to stay secret".Financial Times. ^ Portes, Jonathan; Forte, Giuseppe (2017-05-01) (英語). Macroeconomic Determinants of International Migration to the UK. Rochester, NY. https://papers.ssrn.com/abstract=2979949. ^ Douch, Mustapha; Edwards, T. Huw; Soegaard, Christian (2018). "The Trade Effects of the Brexit Announcement Shock". ^ Giles, Chris (18 December 2017). "The real price of Brexit begins to emerge". Financial Times. ^ "European banks slash UK-related assets by €350bn after Brexit vote". Financial Times. ^ Crowley, Meredith; Exton, Oliver; Han, Lu (21 January 2019). "The impact of Brexit uncertainty on UK exports". VoxEU.org. ^ Breinlich, Holger; Leromain, Elsa; Novy, Dennis; Sampson, Thomas (12 February 2019). "Voting with their money: Brexit and outward investment by UK firms".VoxEU.org. ^ &NA; (2003-05). “How Do I Subscribe to OT?”. Oncology Times 25 (10): 41. doi:10.1097/01.cot.0000295193.76109.9c. ISSN 0276-2234. http://dx.doi.org/10.1097/01.cot.0000295193.76109.9c. ^ Macro, Mainly (9 February 2017). "mainly macro: How Brexit advocates intend to smear economics". mainly macro. ^ "Central bank of the year: Bank of England – Central Banking". Central Banking. ^ Sampson, Thomas (2017). "Brexit: The Economics of International Disintegration". ^ "Secret data show Britain worse off under all Brexit scenarios". Financial Times. ^ Chen, Wen; Los, Bart; McCann, Philip; Ortega-Argilés, Raquel; Thissen, Mark; van Oort, Frank (2017). "The continental divide? Economic exposure to Brexit in regions and countries on both sides of The Channel"
^ "Claim 'hard Brexit' could cost UK£10bn in tax".Financial Times. ^ Stafford, Philip (18 May 2017). "Europe nears decision on base for euro clearing". Financial Times. ^ Lockwood, Matthew; Froggatt, Antony; Wright, Georgina; Dutton, Joseph (1 November 2017). "The implications of Brexit for the electricity sector in Great Britain: Trade-offs between market integration and policy influence". Energy Policy. ^ "Main world producers (2007)" (PDF). ^ Phillipson, Jeremy; Symes, David (1 April 2018). "'A sea of troubles': Brexit and the fisheries question". Marine Policy. ^ "It is likely that the UK would wish to remain an associated member of the European Research Area, like Norway and Iceland, in order to continue participating in the EU framework programmes. "UNESCO Science Report: towards 2030 (PDF). Paris: UNESCO Publishing. 2015. ^ McClean, Paul (30 May 2017). "After Brexit: the UK will need to renegotiate at least 759 treaties". Financial Times. ^ "Leaving the EU – RESEARCH PAPER 13/42" (PDF). House of Commons Library. 1 July 2013. ^ Kämmerer, Jörn Axel (2018-02-14). “Europeanisation of Financial Markets Regulation in Times of Brexit”. European Company and Financial Law Review 14 (4): 637–661. doi:10.1515/ecfr-2017-0029. ISSN 1613-2556. http://dx.doi.org/10.1515/ecfr-2017-0029.